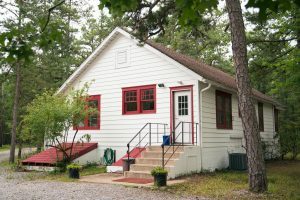 The Rutgers University Pinelands Field Station is a live-in biological research station providing easy access to a wide range of ecosystems in the New Jersey Pine Barrens for research projects and field study in university courses. 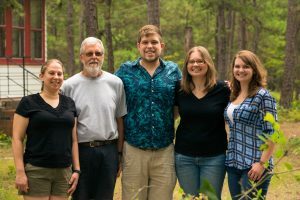 Dr. John Dighton has been Director of the field station since 1994 and Dr. Katie Malcolm joins the station as Manager following the retirement of Dr. Dennis Gray in 2017. The station hosts a number of graduate students, undergraduate students and affiliated researchers from the Rutgers community as well as from many other universities. The U.S. Forest Service also conducts research at the station. Located in Silas Little Experimental Forest, the station became formally affiliated with the Rutgers University Division of Pinelands Research in 1985. Its facilities include laboratories, a greenhouse and growth chambers, a meeting room, a workshop and a dormitory. A weather station is also located on the property. Please contact John Dighton or Katie Malcolm for more information or if you are interested in visiting us. Page last updated by Pinelands Field Station at 10:59 am August 13, 2018 . This page was printed from http://pinelands.camden.rutgers.edu/ at 2:28 PM Thursday, April 18, 2019.